Posted by admin on Jan 31st, 2019 and filed under News. You can follow any responses to this entry through the RSS 2.0. Both comments and pings are currently closed. 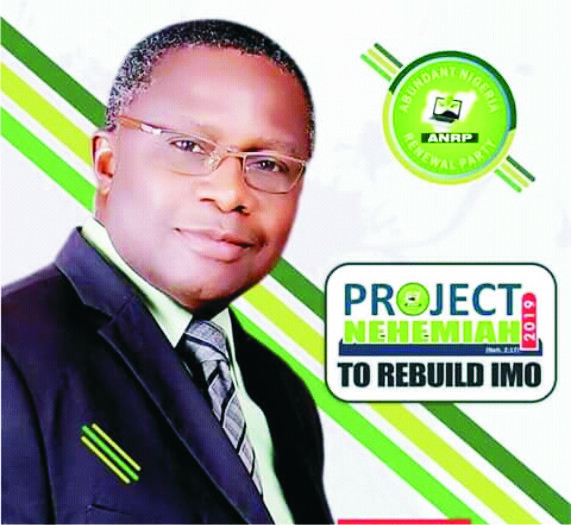 Prof. Alphonsus Ekwereike, a Harvard Trained Scientist and the gubernatorial candidate of Abundant Nigeria Renewal Party, ANRP on Wednesday said his decision to join the race for the governorship election in Imo State was informed by the current sufferings of Ndi-Imo arising from bad leadership. The Imo born renowned Prof. Alphonsus Ekwereike who stated this while fielding questions from journalists at his office in Owerri, Imo State capital said Chief among the rational for joining the race was to serve his people especially now that the state needs help and requires a servant leader like him. Prof. Ekwereike who is the President & Clinical Director, Science Medicine Research Institute (NASA-IASC indexed Asteroids Discovery Institute, NeuroToxic Spongifibrous Syndrome Discovery Institute and unit of Neurosquatemetry & Science Medicine, Inc) said what Imo needs at this point is a servant governor whose administration would run an innovation economy. According to him, “the deplorable state of infrastructure and squalor in the land, if allowed to continue unabated, would lead to total collapse of the system thereby jeopardizing the future of the people of the state as well as our children yet unborn”. He further pointed out that he decided to bell the cat, by throwing his hat into the ring to “save the people of the state from this agony and squalor”, adding that they cannot fold their arms and watch their people to continue to suffer untold hardships. According to renowned Research, “the State is blessed with abundant human and material resources, if fully utilized, can take the State to enviable heights, assuring the people that under his watch they would witness accelerated development. He further stressed that as a Harvard Trained Scientist, he would use his wealth of experience and exposure to mobilize the state for development if given the mandate, promising to run a transparent government. Ekwereike enjoins Imolites to support his aspiration so that together they can salvage the situation, for the common good of the people. While calling on the well meaning people of the state to support him, the intellectual giant said as a researcher, he discovered that Imo state has 289 unindexed natural most needed technological, health and agricultural elements, minerals & plants that are more lucrative than oil that has messed this nation up instead of prospering her. He pointed out that he would call for building new hydropower plants, introduce renewal energies like solar, wind, fluorocell (which I invented), biogas, etc electricity so that people would have choices & this plan would steady the electricity supply & drive down the consumers’ prices. He promised that if elected his administration would introduce a radical innovative educational curriculum in Imo school systems that would enable students & graduates create jobs themselves as against seeking to be employed. I have stem invention Technology Program as my project Nehemiah’s tool, he said.